A holiday in Phuket is preceded by anticipation and arriving in Patong that excitement will escalate and your anticipations exceeded. The energetic vibe is contagious, the beach sizzling, the air is filled with exotic flavors and the nightlife tests your stamina. 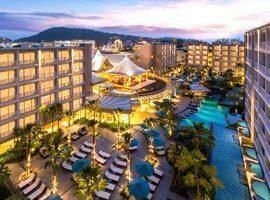 To experience this joyous location to its fullest and be able to retreat to sumptuous comfort and refined hospitality without breaking the bank we offer a guarantee of the best Patong hotel deals for luxury accommodation to cheap places to stay. Another of it's great characteristics is it's vast accommodation choices. While it does draw those individuals who prefer mingling in a cosmopolitan crowd it also offers tranquil seclusion at luxury hotels hidden on forest clad hills like Sea Pearl Villas, Avista Hideaway and Kalima Resort offering private pool villas and sweeping views. To remain within walking distance of the action, but outside earshot of any noise, top-end beachfront resorts like the trendy B-Lay Tong and La Flora are only two of many options. If you want to feel the vibe on your skin we suggest classy places near nightlife in Bangla Road like The Kee Phuket or hotels with cheap deals while still offering treats like rooms with direct pool access. 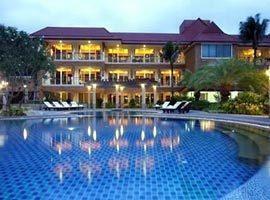 And, don't think our accommodation in Patong is not suited for families. There are many places to stay if you are traveling with kids like Graceland Resort, Holiday Inn and BYD Lofts. 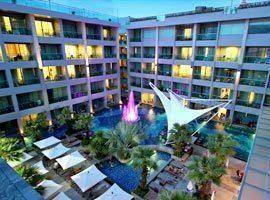 Located on the fringes of the entertainment zone, Andatel is near Bangla Road, yet offers a sense of peaceful serenity. 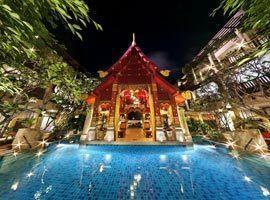 It offers charming superior and deluxe rooms as well as pool access rooms. 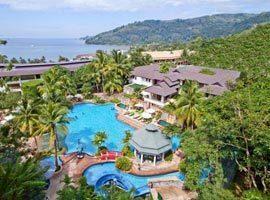 Located on a lush hilltop Avista Hideaway allows captivating views of the bay. Rooms are the epitome of stylish luxury and offer generous space. 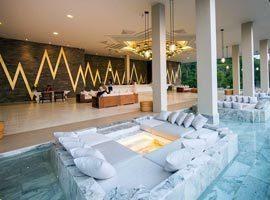 Choose a Jacuzzi suite, private pool suite or family suite. B-Lay Tong is modern and chic, offers a trendy beach club and ideally located a 10 minute walk from entertainment outside earshot of noise. 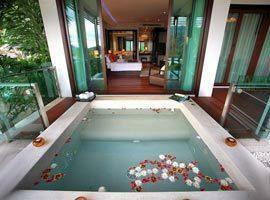 Enjoy a jacuzzi on your balcony or pool front deluxe room. 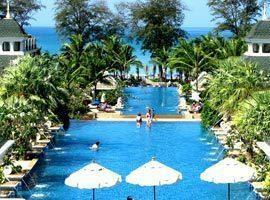 Beachfront resort with a degree of popularity which suggest booking early to avoid disappointment. Step from your private terrace into your jacuzzi from where you have direct access to an exclusive pool. Burasari enjoy high guest ratings and offer art-deco rooms and romantic honeymoon accommodation featuring 7 foot king beds and a bath tub in a private outdoor garden terrace. Utter tranquility and views from an enchanting hilltop setting. Offers a Lady's Suits in woman's only section, romantic suite with jacuzzi tub and water curtain, 2 bedroom family suite and private pool villas. 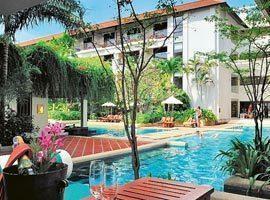 Luxury hotel offering ideal accommodation for couples and families in spacious suites near entertainment. 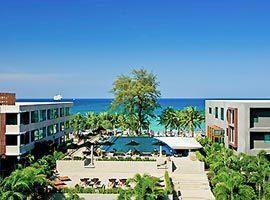 Highlights include a spa, state of the art fitness centre, and pool with swim-up bar. We urge you to book early due to popular demand. The Kids Suite and Family Suite offers the children's own area equipped with toys. It is also a great place to stay for couples in rooms featuring jacuzzis. 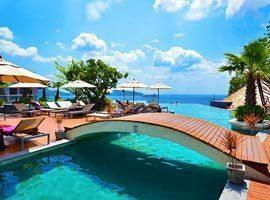 Luxury hillside seclusion wrapped in tranquility near entertainment. Romantic honeymoon suites and spacious villas, dining with exceptional views and an artificial beach with bay views. La Flora is a boutique 5 star hotel right on the oceanfront featuring private pool villa accommodation including 1 bedroom beachfront villas for a romantic holiday as well as 2 bedroom villas for families. 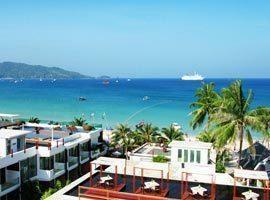 This 4 star hotel is perched on a hillside with views of Kalim Bay and offers easy access to nightlife and shopping. 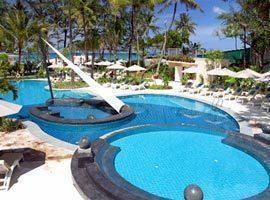 It offers a 3 tiered swimming pool, 2 tennis courts, a fitness centre and kids club. Located right on the beach and offers deluxe sunset sea view rooms, rooms offering direct access to a private infinity edge pool, family facilities like a kids club and a 2 bedroom family suite. 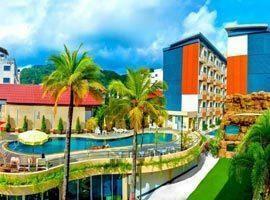 R-Mar Resort Phuket is proof that a budget hotel is not synonymous with a lack of facilities and bad standards. It offers stunning rooms within a 5 minute walk of nightlife and the Jungceylon Mall. Located amid tranquility on a verdant hillside all rooms and suites at this Patong resort features its own jacuzzi on a private balcony. Facilities include a club house with spa and fitness centre. The Kee is located in the centre of the entertainment area and near nightlife in Bangla Road. 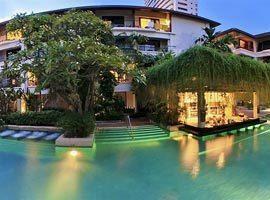 It features a shopping plaza, a delectable spa offering one on one consultations and flashy accommodation.